NCFM eSnurra Group claim to predict/estimate both EDD and GA by conflating prediction/estimation with calculation. It is important to understand a prediction/estimation of EDD is not synonymous with the calculation of GA using the equivalent of Naegele's rule, in reverse. This is important to understand in order to avoid unnecessary confusion and deception. There is already enough conflate-to-obfuscate in the political sphere, lest it be allowed to further obfuscate the practice of evidence-based medicine with respect to obstetric and fetal medicine. Compliment Calculation: EDD can be calculated using the equivalent of Naegele's rule by subtracting the predicted/estimated GA from the date of the ultrasound to calculate a virtual LMPD to which, depending on the method, 280, 281, 282, or 283 days are added to calculate EDD. Compliment Calculation (warning: this is problematic): GA can be calculated using the equivalent of Naegele's rule, in reverse, by subtracting, depending on the method, 280, 281, 282, or 283 days days from the EDD date to calculate a virtual LMPD (GA = 0w+0). Or, GA can be calculated using the equivalent of Naegele's rule, in reverse, by subtracting the predicted/estimated number of days remaining on the ultrasound date to birth/delivery from 282 days to calculate GA on the date of the ultrasound exam. 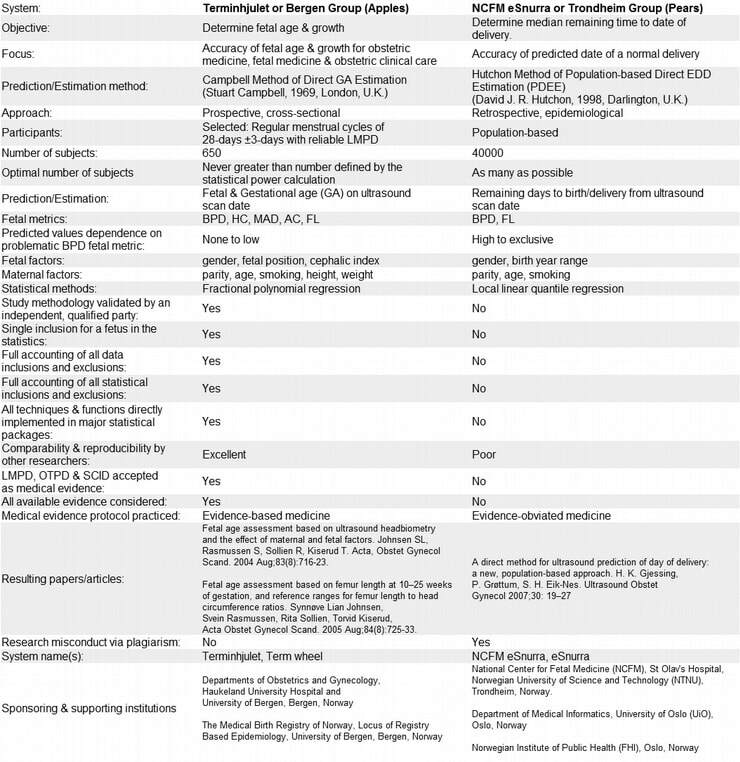 [Note: Dr. Hutchon warned against doing this by explicitly stating: "Provided the fetus can be assessed as normal using other criteria [i.e., direct GA estimation in conjunction with all available evidence in the practice of evidence-based medicine], this chart can be used to provide the best estimate of the date of delivery (EDD)." and "...there is no pretence that this method is determining fetal age" (Hutchon 1998). ​Norwegian Implementation: NCFM eSnurra Group (Trondheim Group)'s NCFM eSnurra or eSnurra "method" is an appropriated, plagiarized, misused implementation of the Hutchon Method of PDEE. NCFM eSnurra Group uses the Hutchon Method of PDEE to estimate EDD, but NCFM eSnurra Group also claim to estimate GA. NCFM eSnurra Group's "method" does not estimate GA; NCFM eSnurra Group must calculate GA using the equivalent of Naegele's rule, in reverse. The fact NCFM eSnurra Group also obviate a woman's key pregnancy dates within a government-mandated protocol of evidence-obviated medicine in order to eliminate a woman's medical evidence is an additional, dangerous, separate issue. Unfortunately, but not surprisingly, when these issues are combined, the consequences include unnecessary, increased medical risks, critical medical mistakes and grievous medical harms. 2001: Taipale & Hiilesmaa Collaboration with National Center for Fetal Medicine (NCFM), Trondheim University Hospital Trondheim, Norway and Helsinki University Central Hospital, Helsinki, Finland): appropriated, plagiarized and used the Hutchon Method of Population-based Direct EDD Estimation (PDEE) with an approach that used first-trimester, singleton pregnancies, ultrasound measurements of fetal crown rump length (CRL), biparietal diameter (BPD), and femur length (FL) to predict/estimate the remaining gestation days from ultrasound exam date to delivery date. The supporting models used univariate & multiple linear regression (GA was limited to >= 37w) and non-linear models in a retrospective, population-based, study of 17,221 routine ultrasound exams acquired from historical database records. Each fetus in the study was restricted to a single measurement in the statistics. Optimal number of subjects: as many as possible. Comparability & reproduciblilty for other researches: Excellent, all techniques & functions were implemented in the major statistical packages. Resulting paper: Predicting Delivery Date by Ultrasound and Last Menstrual Period in Early Gestation TAIPALE, PEKKA MD, PhD; HIILESMAA, VILHO MD, PhD. Obstetrics & Gynecology: February 2001 - Volume 97 - Issue 2 - p 189–194. Received May 30, 2000. Received in revised form September 25, 2000. Accepted October 12, 2000.